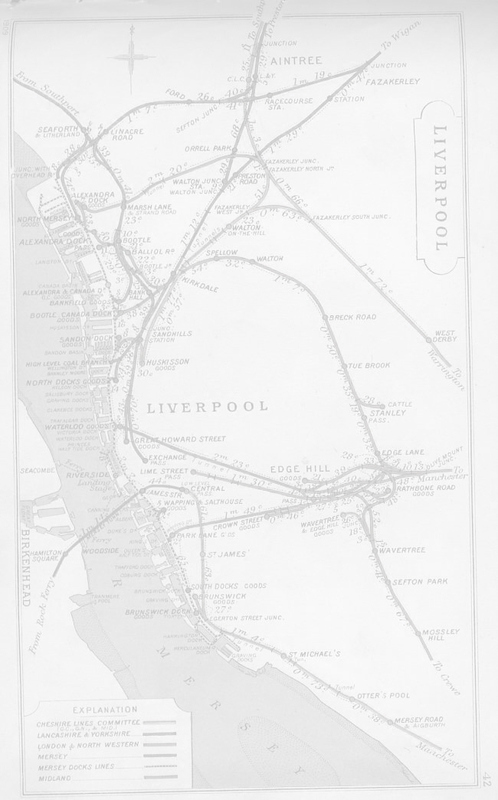 One of the most interesting forms of traffic over the North Liverpool extension line (i.e Halewood to Aintree and Huskisson) were the annual race specials to Aintree Central, run once a year for race goers to the Grand National Meeting at Aintree. These were supplemented by Horse Box trains conveying the horses themselves, operating as early as the Wednesday before the actual meeting. These Horsebox trains over the post war years seem to have brought a fairly steady stream of B17's from such depots as March and Cambridge and I would suspect that B1's and K3's would also have been seen on such traffic. Loco's off incoming specials were serviced down the line at Walton Depot (27E) Given that in later years the turntable there was out of action, things must have a been a bit on the hectic side - Loco's being sent out to turn via the triangle at Walton! See Fazakerley Jnc'c North South and West on the map below. It seems there was usually a station pilot in evidence at Aintree on these days, 4F 43988 being used on one occasion in the 60's. It's duties that day included turning a whole train on the triangle at Walton due to the fact that it contained an ex Devon-Belle Observation Car in it's formation. It was not unknown before WW2 for incoming loco's and stock to be sent up to Southport Lord St (after emptying) in order to be serviced there. This was due to the immense pressure on the shed at Walton. I haven't come across evidence of this practice post WW2, but it could not be ruled out. I await peoples notes on this with interest. Given what a spectacular attraction Aintree Central was on GN days, it is amazing how little evidence exists of this traffic in the form of photographs (And certainly not as far as I know, at all on Cine) That said I recommend you check out a wonderful set of photographs in a fairly recent edition of Backtrack. I don't have the full details of this to hand , but will post them here asap. See also Steam World for March 1992 which includes some colour shots too! I look forward to posting your Aintree Central GN photographs here in the not so distant future! Watch this space!.